Part 3 of my interview with Gil Cohen, an artist who once painted hundreds of cover paintings and interior illustrations for men’s adventure magazines, picks up after he was discharged from the Army in 1956. If you missed the previous installments, click this link to read Part 1 and this link to read Part 2. COHEN: When I got out of the Army, I went to New York and got lucky, and did work for a lot of the men’s adventure magazines. It was a great time for a young artist to get work in New York. There was a lot of illustration. There were so many magazines back then, not to mention a lot of work for ad agencies. One of my biggest accounts was the Magazine Management company. 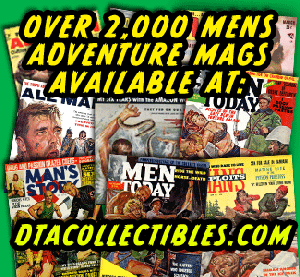 It’s truly amazing how many great artists worked for the men’s adventure magazines. COHEN: Not to mention the writers. You know Bruce Jay Friedman and Mario Puzo both worked for Magazine Management back then. Yes, I’ve written some previous posts about Friedman and Puzo on the blog. COHEN: Now, I have to say, and I don’t think I mentioned this in my book [Gil Cohen: Aviation Artist], the art director there was the most wonderful man, by the name of Larry Graber. In many ways he mentored me. You expect some kind of a gruff New York type sonofabitch to be the art director. But he was the nicest man you’d ever want to meet. A very gentle soul. He was a World War II veteran, and when I first met him I think he said he was 42. I would have been in my late twenties. 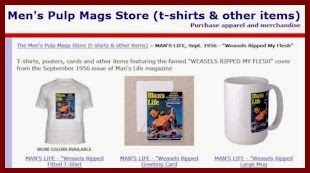 My period working for Magazine management started in the spring of 1956 and eventually ended in the early ‘70s. The men’s adventure magazine genre was fading away at that point. COHEN: Exactly. And, I was moving on to other kinds of art, like books covers. You told me your first men’s adventure magazine illustration assignment was an interior duotone for Real. After you started working regularly for the men’s adventure mags, did you have any preferences in terms of the types of assignments you got or which magazines you worked for? COHEN: Well, I did a lot of interior illustrations and, as I’ve said, I really loved doing duotones for interior spreads. But covers paid more. About twice as much, or in that area. Some magazines, like Argosy and True, paid more than others. They were more upscale and had higher circulations than the Magazine Management magazines. But Magazine Management kept me very busy. Clearly! I think just about every issue of Stag, Male or Men from the late 1950s to the mid-1970s features a cover painting or interior illustration by you. 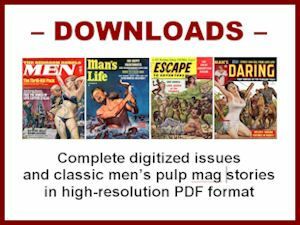 The all-fiction digest pulps that were published from the 1920s to the early 1950s? 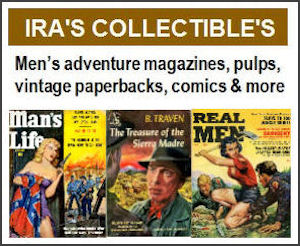 COHEN: Yes, that’s a different genre than men’s adventure magazines, though the men’s action-adventure magazines certainly came from the pulps. Their antecedents were the pulps. That’s why some people, including me, sometimes refer to them as men’s pulp magazines. Adam Parfrey called them the the “postwar pulps” in his 2003 book about the genre, It’s a Man's World. COHEN: It’s sort of funny to me, because back in 1994 when the movie Pulp Fiction came out all the young people loved it and latched on to the terms “pulp” and “pulp fiction,” but many had no idea where those terms come from. No idea whatsoever. Those terms also get applied to the whole genre called pulp paperbacks, which you painted a lot of covers for. The pulp paperbacks and many of the men’s adventure were printed on a cheap, pulpy paper, though it wasn’t the same heavy, coarse pulp paper used for the classic pulp fiction magazines, and they had a lot of over-the-top cover art and stories like the old pulps. COHEN: I remember liking those old pulp magazines when I was in high school and in art school. I was definitely a fan. I was also a fan of what later came to be called film noir. I loved those movies growing up. I flipped over those movies. I still do. I have a modest collection on DVD. I love movies. Movies definitely influenced my work in a very big way. A lot of your paintings for the men’s adventure magazines look very cinematic. COHEN: Oh, yeah. My early art influences were popular illustrators of the time. After a time, I also began to be influenced by Nineteenth Century painters, particularly some of the American Nineteenth Century painters, like Winslow Homer and John Singer Sargent. And then, by painters who came before them, a lot of the European Renaissance painters, like Caravaggio. I just love his way with chiaroscuro, the play of light and dark. And you see that effect in film noir. So, a lot of my influences, visually and painterly, and more and more in my recent work, have been being great Nineteenth century and classical painters. But on the other hand, compositionally, the influence is film. I know the magazine art directors generally gave artists the directions for illustrations. Did they ever ask you to read the stories you illustrated? COHEN: (Laughing.) No, thank God. Once you got an assignment, did you always give the art director an initial sketch? COHEN: Oh, yes. You had to. Did you use live models? COHEN: Yes. I took photographs of models. But not at the sketch stage. In the sketch stage I made up the figures, with very few exceptions. When it came to the finished painting, very often I would pose myself for the male figures. That didn’t cost me anything. I was free and always around. I would set up a Polaroid camera on a tripod and I would use the self-timer, which gave me 10 seconds to get in place and do the pose. If it didn’t look good, I’d do it again until I got what I wanted. Eventually I realized that was very hit or miss. 10 seconds didn’t really give me much time. So, I got one of those rubber bulbs with a long cable attached to the shutter release. Then I could just take my time, set myself up and, when I was ready, squeeze the bulb and take the picture. That worked out a whole lot better. (Gil laughs, then says jokingly...) The only problem is that, if you look at my illustrations, many of the guys have their right hand in a fist, as if they’re holding something. You also uses female models? COHEN: Yes, of course. You had to. I could pose myself and make myself into any race, any height, any age, except a kid. I couldn’t make myself a boy. And, I couldn’t make myself a female. When I needed reference photography for women, I would photograph real live female models. What was the going rate for a model? COHEN: Back then it could be $25 an hour. It could be higher. By the time I was doing romance book covers in the 1980s the models were getting $100 an hour. Didn’t that take a bite out of your fee? COHEN: Not from me, at least not on book cover assignments. The publishers paid for that. They wanted to make sure the artists didn’t do anything dumb, like copy a photograph that somebody could make a claim on. They wanted to know you used legitimate models and that it was paid for. Did the men’s adventure magazines pay for models? COHEN: Not normally. It was catch as catch can with them. Did you usually get your original artwork back from the magazines? COHEN: I got back most of the art I’d ever done. Not everything. At one point in the 1970s, I had hundreds and hundreds of paintings and illustrations I’d done for men’s action and adventure magazines and decided to get rid of nearly all of them. And, so I sold them very, very cheaply. You might find this hard to believe. In the mid-1970s, when I was no longer doing that work, and I wanted to get rid of it, my older brother owned a hardware store in Philadelphia. And, he said to me: “Supposing I set up a bin in the back the store, where people can browse and look at the artwork, and if I put on real cheap prices, you know, you can sell ‘em.” And, at that point I said OK – and I’m sorry I did. A lot of my original paintings you see on the Internet today came from that hardware store bin in Philly originally. Oh, man! And now those paintings are selling for big bucks on eBay and the Heritage Auction Galleries website. COHEN: Yeah. And, a lot of them probably came from the sale at my brother’s hardware store. I regret it today, but at the time I just didn’t want to look at them or store them anymore. Wow. I wish I could have been there. 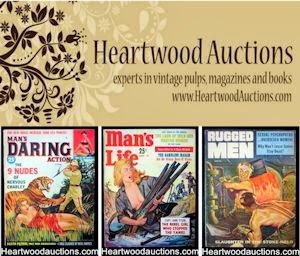 I recently saw an original 16 by 24 inch duotone painting that you did for For Men Only magazine in the 1960s on the Heritage Auction site. It shows a guy hung up on the wall of a carnival-like shooting gallery being shot at by a clown. It sold for a lot of money. COHEN: Yeah, I remember it. That was a weird one. Of course, the prices I get today for my aviation artwork is far beyond any of that. But I worked my way up to this point. In the early ‘90s I stopped doing regular commercial illustration. I had done that for decades — magazine art, book covers, movie posters. And at that point I felt I needed to pursue some of the things that are closer to me as far as my own loves are concerned. One of them is aviation history, particularly World War II and before. Well, Gil, I greatly appreciate you talking with me about the days before you were a famous aviation artist. COHEN: You’re welcome. And, remember, make sure you tell people I’m still active. Of course. And, I hope I’m still as active as you when I’m 79 years old.